Government of Khyber Pakhtunkhwa has announced 37 Latest Jobs in Pakhtunkhwa Hydel Development Organization. Candidates, who have required Qualification and Experience, can apply for these Latest Government Jobs. 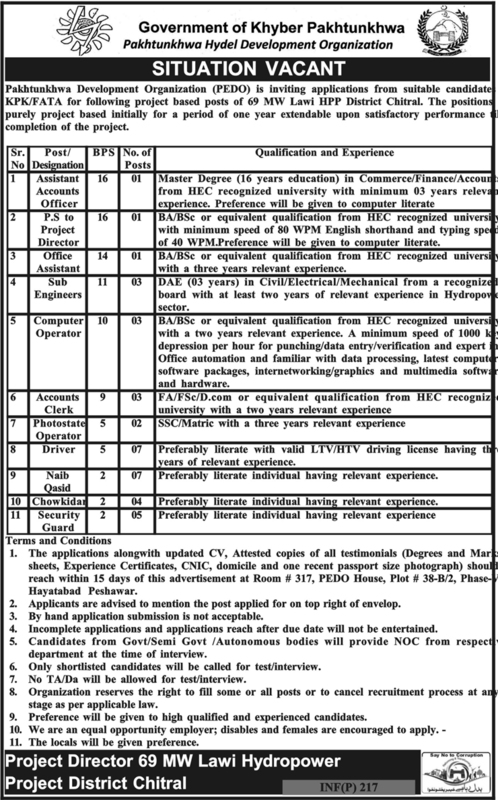 Jobs titles and number of posts are as follows, Assistant Account Officer (BPS-16) 01 Post, P.S to Project Director (BPS-16) 01 Post, Office Assistant (BPS-14) 01 Post, Sub Engineers (BPS-11) 03 Posts, Computer Operator (BPS-10) 03 Posts, Accounts Clerk (BPS-09) 03 Posts, Photostat Operator (BPS-05) 02 Posts, Driver (BPS-05) 07 Posts, Naib Qasid (BPS-02) 07 Posts and Chowkidar (BPS-02) 04 Posts. Hurry up apply for these jobs and make your future bright.